My children are ages 7, 4, and 3. 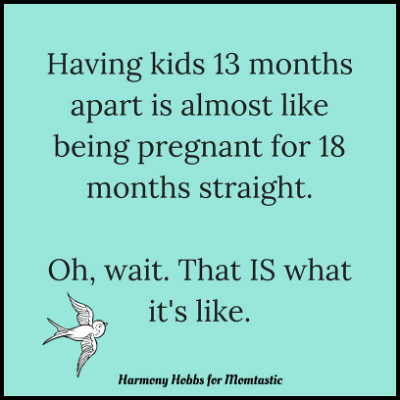 After our first child was born, I immediately wanted another one; looking back, I’m certain it must have been the hormones talking, because what was I thinking?! Thankfully, my husband had the good sense to make us wait. 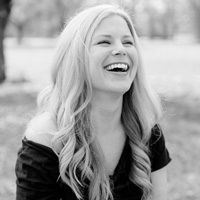 When our second child arrived exactly three years later, I quit my job in insurance and became a stay-at-home mom. Things were already so insane that I decided to add a third baby to the mix, because why not? Honestly, it was pretty arrogant of me to think that I would be able to care for three human beings so close in age, without losing my mind — and yet, here we are. We’re surviving … barely. The thing about having children close together is that when they are small, like mine are, they herd around their mother like ducklings. I am always stepping on someone or bumping into someone, and little hands are constantly touching me. Just this afternoon, I was giving my older two a shower while simultaneously coaching my youngest through her first potty-trained poop. By the time we were done, the bathroom looked like a muddy, toilet-papered bomb went off. Now that we’ve established what it’s like to have kids close together, how far apart should you have your kids? Plenty of experts have weighed in on the topic: It is recommended that women wait 18 to 24 months before becoming pregnant again to reduce the risk of health complications (although there is limited data to support this timeframe). And, experts say that spacing siblings at least two years apart makes kids smarter. But, where are the moms who have actually dealt with the children? To help you decide what’s best for YOUR family, I have compiled a reality check of what kid spacing really looks like, from 13 months to 5+ years apart. This kind of kid spacing is a logistical nightmare. Two children in diapers, one is teething while the other learns how to climb out of his crib, and they both take turns waking their parents up at night. One needs to be fed every four hours, and the other one is just learning to eat solid food. It’s a circus, and yes — these ARE your monkeys. 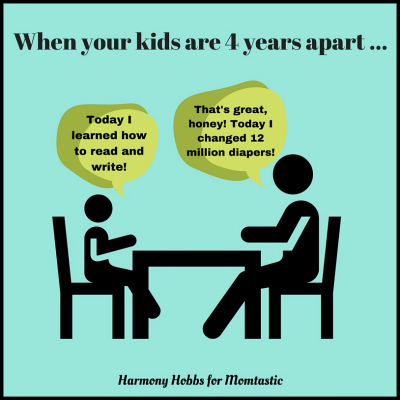 My younger two are 21 months apart, and while we make it work and they both appear happy and well-adjusted, I kind of feel like I am dying over here. It literally seems like I just finished potty training my middle child — he still has accidents at night — and now here I am doing the exact same thing with my youngest. It feels a lot like potty purgatory. Send help … and wine. This is the gap between my oldest and middle, which was nice because my older one has always been able to help with his little brother. 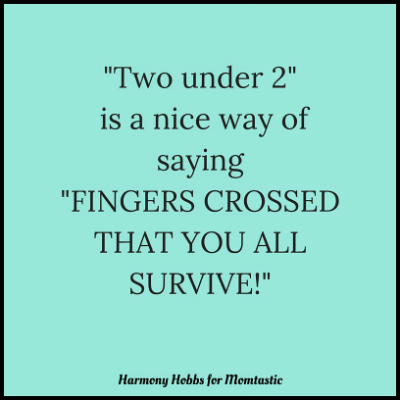 It was kind of awful, though, to have a colicky newborn and a “threenager” at the same time. And by “kind of awful” I mean that I’ve mostly blocked it from memory. This is a good spacing if you need the older one to be in school by the time the next child is born. I personally have not experienced that phenomenon, but I’ve heard it’s amazing. 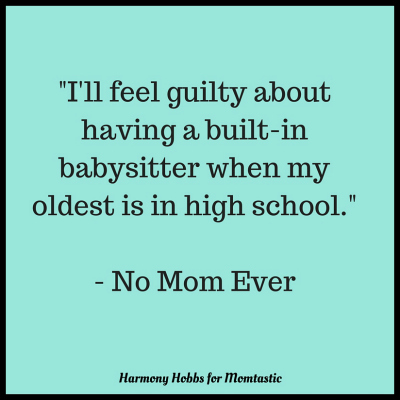 However, it is important to note that when they do start school, you’ll have to juggle crazy schedules with kids that far apart in age. 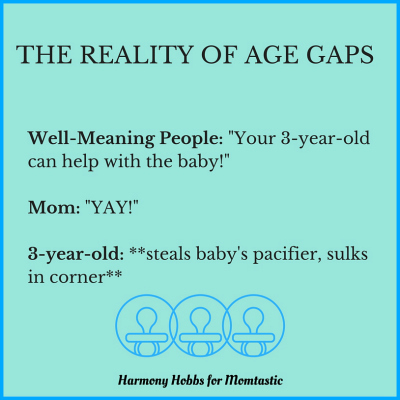 Sure, it’s a pretty big gap, but by the time your older one is a teenager, you’ll have a built-in babysitter, so obviously I’m totally on board with this idea. TOTALLY. ON. BOARD.